Gurukul Shiksha Sanstha's Shree Maharishi Vidya Mandir School, Chandrapur has advertised in THE LOKMAT newspaper for recruitment of PGT, Pre-Primary Teachers jobs vacancies. Interested and eligible job aspirants are requested to apply with in 7 days.Check out further more details below. 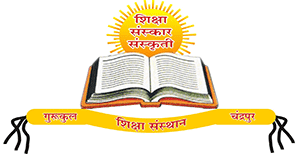 Name of the School: Gurukul Shiksha Sanstha's Shree Maharishi Vidya Mandir School, Chandrapur. 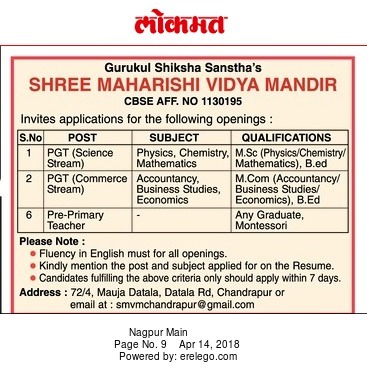 About School: Run by Gurukul shiksha Sanstha's cbse board.It is a famous school in Maharashtra and co educational institutions. Fluency in English is Must for all openings. Kindly mention the post and subject applied for on the resume. How to Apply: Candidates fulfilling the above criteria only should apply with in 7 days.